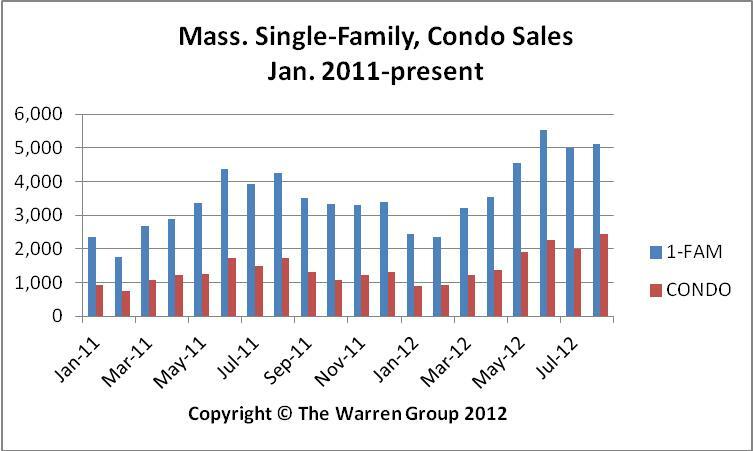 Sales of both Massachusetts single-family homes and condominiums rose in August – the seventh straight month both property types posted a year-over-year increase, according to the latest report by The Warren Group, publisher of Banker & Tradesman. A total of 5,118 single-family homes sold in Massachusetts in August, a 20 percent increase from 4,262 sales in August 2011. This is the second time sales have surpassed the 5,000 mark this year. Year-to-date sales are up 24 percent at 31,733, compared to 25,581 during the same period a year ago. The median price of single-family homes increased 1.6 percent to $310,000 in August, up from $305,000 a year earlier. This marks the third straight month this year that the median price exceeded $300,000. The median price for homes sold January through August was $290,000, down 1.7 percent from $295,000 in the prior year. In August, condominium sales statewide increased 40 percent – continuing the significant sales volume increase throughout much of this year. A total of 2,432 condos sold in August, up from 1,736 a year ago. Year-to-date condo sales are up almost 28 percent, rising to 13,040 from 10,173 during the same period last year.